Hello my name is Natasha and I have been a childminder for the past 9 years( I am from South America and English is my first language). Before this I worked in a nursery for 3 years and when my son was born I wanted to be his primary caregiver as such Childminding was the perfect job for me. The first little girl I took care of is now my son 's best friend since they grew up together. As my son got older I expanded the business and today have a happy little family of babies and parents. My first insepction we gained an Outstanding rating from Ofsted and was the first childminder to achieve this grade in the Merton Borough. I am passionate about what I do and give an exemplary level of care. Once again we have successfully gained another OFSTED OUTSTANDING result for 2016. We gained Outstanding in all areas. In our setting we have two staff members who work with between 6-8 children each day. The kids are always surrounded by us and are never left on their own at anytime. ROSEINA came on board recently and has been a great addition to Little Kinder. 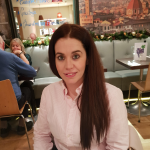 Roseina is Irish born living and working in London as a qualified teacher..She has given up teaching to come on board with LITTLE KINDER on a full time basis to work with little ones. We have been registered by Ofsted and have up to date first aid training , safeguarding and several more certificates training in childcare. We love children and it is an absolute joy to see them grow into little individuals before your eyes. As aunts and mums we know all the anxieties and stress of leaving your child with a virtual stranger and we work closely with parents to make this transition as stress free as possible. We send pictures (with parental consent) and daily updates, We organise events throughout the year to encourage the parents to meet and socialise with each other and to see how the children interact with me and my friends who also work along with me in my setting. We have a summertime picnic, Christmas parties, birthdays and Halloween parties. The children are in a safe loving environment where cuddles are generously given and each child in our care is happy to come in every morning. We go on outings and because of our nursery training we have a structured play and learn time for the children. We have excellent references which are available upon request. We are different because with each family my extended family grows. We stay in touch with parents even after the children are gone from our care. All our children are taught to be polite and respectful and we work with the parents to continue what is being taught at home. Two years ago we were fortunate enough to be offered a non domestic premises to open a Nursery. Ofsted has approved our registration to open a day Nursery in Morden on Martin Way. We also just got our first inspection this January 2019. Our day Nursery has a maximum of 10 children but currently we are working with 5-7 little ones. Little Kinder Nursery is now open to the public and have space available. I have been childminding for the past10 years in my home in Merton Park. Prior to becoming a childminder I worked in a Nursery environment caring for children from the ages of 3 months to 4 years for a couple of years. (1 year in USA and 1 year in the UK). My current Diploma in Post Natal Maternity Skills Level 3 allows me to work closely with New mums and newborn babies as well. Roseina Desmond has been teaching for 10+ years and still tutors after hours and on weekends..
She is a fully qualified teacher and has gained two Outstanding from Ofsted over her years of teaching. I have completed the following courses below. NVQ Level 3 in Childcare Learning and Development. Level 2 award in Food Safety in Catering. We currently have vacancies for full time child ages 0-8 years old. Part time is available for three - four days a week.Full time vacancy available. All outings are paid for by me. Below are the latest reviews for LITTLE KINDER NURSER. Please note that reviews represent the subjective opinions of other Childcare.co.uk users and not of Childcare.co.uk. Parents must carry out their own checks and references on childcare providers to ensure that they are completely happy before enaging in the use of their services. Natasha looked after my son from the age of 1 until he was nearly 3. By the very fact that within days of being with her my son did not want to come home when we came to pick him up just spoke volumes about the care he was getting from her. Natasha provides a fun caring environment and reports fully on everything my son did during his day. My son was a fussy eater but Natasha’s homemade food went down a treat even to the point that he asks for it at home! We highly recommend her services and feel that our son could not have been taken care in a more professional and loving environment. My daughter has been with Natasha for 4 days a week since May 2011 when she was 13 months old (she is now nearly 3 and a half). My son has also just started with Natasha, aged 13 months. We are completely happy with the care that Natasha provides for our two children. Natasha has an assistant so is able to have up to 6 children in her care which creates a wonderful "mini-nursery" environment in her home where the children thrive on having others to play with. Natasha is intelligent and sensitive - she has an intuitive understanding of each child and very quickly knows how to make them feel at home. Natasha is very loving and gives all the children lots of cuddles. She has a gentle but firm approach which helps to ensure the children grow up polite and well behaved. Natasha has a good size garden for the children to play in with lots of toys, and they also go to local parks. Natasha cooks healthy meals for the children. We have had our baby boy with Natasha since he was 7 months old (now 16months) and he is very happy with her. She's a really caring loving person (as are her assistants) and we are so pleased we found her! She does a lot of fun things with them, cooks great food and our baby really loves her.